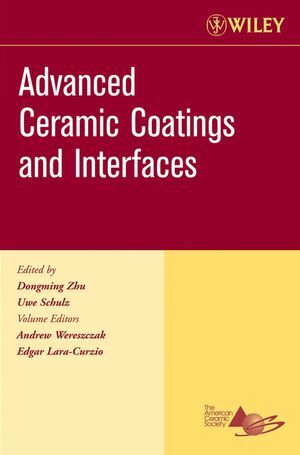 Recent advances in coating development, processing, microstructure and property characterization, and life prediction are included in this book, which came from the proceedings of the 30th International Conference on Advanced Ceramics and Composites, January 22-27, 2006, Cocoa Beach, Florida. Organized and sponsored by The American Ceramic Society and The American Ceramic Society's Engineering Ceramics Division in conjunction with the Nuclear and Environmental Technology Division.. Integrated structural, environmental properties and functionality through advanced coating processing and structural design are emphasized in this book. Advanced Thermal Barrier Coating Development and Testing. Relation of Thermal Conductivity with Process Induced Anisotropic Void Systems in EB-PVD PYSZ Thermal Barrier Coatings (A. Flores Renteria, B. Saruhan, and J. llavsky). Segmentation Cracks in Plasma Sprayed Thin Thermal Barrier Coatings (Hongbo Guo, Hideyuki Murakami, and Seiji Kuroda). Design of Alternative Multilayer Thick Thermal Barrier Coatings (H. Samadi and T. W. Coyle). Creep Behaviour of Plasma Sprayed Thermal Barrier Coatings (Reza Soltani, Thomas W. Coyle, and Javad Mostaghimi). Corrosion Rig Testing of Thermal Barrier Coating Systems (Robert VaOen, Doris Sebold, Gerhard Pracht, and Detlev Stover). Thermal Properties of Nanoporous YSZ Coatings Fabricated by EB-PVD (Byung-Koog Jang, Norio Yamaguchi, and Hideaki Matsubara). Oxidation Behavior and Main Causes for Accelerated Oxidation in Plasma Sprayed Thermal Barrier Coatings (Hideyuki Arikawa, Yoshitaka Kojima, Mitsutoshi Okada, Takayuki Yoshioka, and Tohru Hisamatsu). Crack Growth and Delamination of Air Plasma-Sprayed Y203-ZrO, 8 1 TBC After Formation of TGO Layer (Makoto Hasegawa, Yu-Fu Liu, and Yutaka Kagawa). Lanthanum-Lithium Hexaaluminate-A New Material for Thermal Barrier Coatings in Magnetoplumbite Structure-Material and Process Development (Gerhard Pracht, Robert VaOen and Detlev Stover). Modeling and Life Prediction of Thermal Barrier Coatings. Simulation of Stress Development and Crack Formation in APS-TBCS For Cyclic Oxidation Loading and Comparison with Experimental Observations (R. Herzog, P. Bednarz, E. Trunova, V. Shernet, R. W. Steinbrech, F. Schubert, and L. Singheiser). Numerical Simulation of Crack Growth Mechanisms Occurring Near the Bondcoat Surface in Air Plasma Sprayed Thermal Barrier Coatings (A. Casu, J.-L. Marques, R. VaOen, and D. Stover). Comparison of the Radiative Two-Flux and Diffusion Approximations (Charles M. Spuckler). Damage Prediction of Thermal Barrier Coating (Y. Ohtake). Environmental Barrier Coatings for Si-Based Ceramics. The Water-Vapour Hot Gas Corrosion Behavior of AI,03-Y,03 Materials, Y,SiO, and Y3Al,0,,-Coated Alumina in a Combustion Environment (Marco Fritsch and Hagen Klernm). Evaluation of Environmental Barrier Coatings for SiC/SiC Composites (H. Nakayama, K. Morishita, S. Ochiai, T. Sekigawa, K. Aoyarna, and A. lkawa). Life Limiting Properties of Uncoated and Environmental-Barrier Coated Silicon Nitride at Higher Temperature (Sung R. Choi, Dongrning Zhu, and Rarnakrishna T. Bhatt). Multilayer EBC for Silicon Nitride (C. A. Lewinsohn, Q. Zhao, and B. Nair). Non-Destructive Evaluation of Thermal and Environmental Barrier Coatings. Characterization of Cracks in Thermal Barrier Coatings Using Impedance Spectroscopy (Lifen Deng, Xiaofeng Zhao, and Ping Xiao). Nondestructive Evaluation Methods for High Temperature Ceramic Coatings (William A. Ellingson, Rachel Lipanovich, Stacie Hopson, and Robert Visher). Nondestructive Evaluation of Environmental Barrier Coatings in CFCC Combustor Liners (J. G. Sun, J. Benz, W. A. Ellingson, J. G. Kimmel, and J. R. Price). Ceramic Coatings for Spacecraft Applications. Charging of Ceramic Materials Due to Space-Based Radiation Environment (Jennifer L. Sample, Ashish Nedungadi, Jordan Wilkerson, Don King, David Drewry, Ken Potocki, and Doug Eng). Spacecraft Thermal Management via Control of Optical Properties in the Near Solar Environment (David Drewry, Don King, Jennifer Sample, Dale Clemons, Keith Caruso, Ken Potocki, Doug Eng, Doug Mehoke, Michael Mattix, Michael Thomas, and Denis Nagle). Preparation of Carbon Fiber Reinforced Silicon Oxycarbide Composite by Polyphenylsilsesquioxane Impregnation and Their Fracture Behavior (Manabu Fukushima, Satoshi Kobayashi, and Hideki Kita). Interfacial Processing Via CVD For Nicalon Based Ceramic Matrix Composites (Christopher L. Hill, Justin W. Reutenauer, Kevin A. Arpin, Steven L. Suib, and Michael A. Kmetz). Coatings of Fe/FeAIN Thin Films (Yuandan Liu, R. E. Miller, Tao Zhang, Qiquan Feng, W. Votava, Dingqiang Li, L. N. Dunkleberger, X. W. Wang, R. Gray, T. Bibens, J. Helfer, K. Mooney, R. Nowak, P. Lubitz, and Yanwen Zhang). Polymeric and Ceramic-Like Coatings on the Basis of SiN(C) Precursors for Protection of Metals Against Corrosion and Oxidation (M. Gunthner, Y. Albrecht, and G. Motz). Effect of Temperature and Spin-Coating Cycles on Microstructure Evolution for Tb-Substituted SrCeO, Thin Membrane Films (Satyajit Shukla, Mohamed M. Elbaccouch, Sudipta Seal, and Ali T-Raissi). Development of Boridized Passivation Layer for Use in PEM Fuel Cells Bipolar Plates (K. Scott Weil, Jin Yong Kim, Gordon Xia, Jim Coleman, and Z. Gary Yang). Carbon-Fiber-Reinforced Low Thermal Expansion Ceramic Matrix Composites (C. M. Chan and A. J. Ruys). Development of the Impeller-Dry-Blending Process for the Fabrication of Metal-Ceramic Functionally Graded Materials (D. T. Chavara and A. J. Ruys).